The zero-click experience in the Happy Hours app. Some of the best user interfaces being created today are on mobile devices. I often find myself reaching for my cell phone instead of my laptop when I need a hit of information. Common tasks such as looking up a business, buying movie tickets or checking email are often faster on mobile devices. The best example of this is the Happy Hours app. Launch the app and after a few seconds it will show you the nearest happy hour specials sorted by distance that are going on right now. No input required. Why are mobile interfaces better? Access to sensors such as GPS. 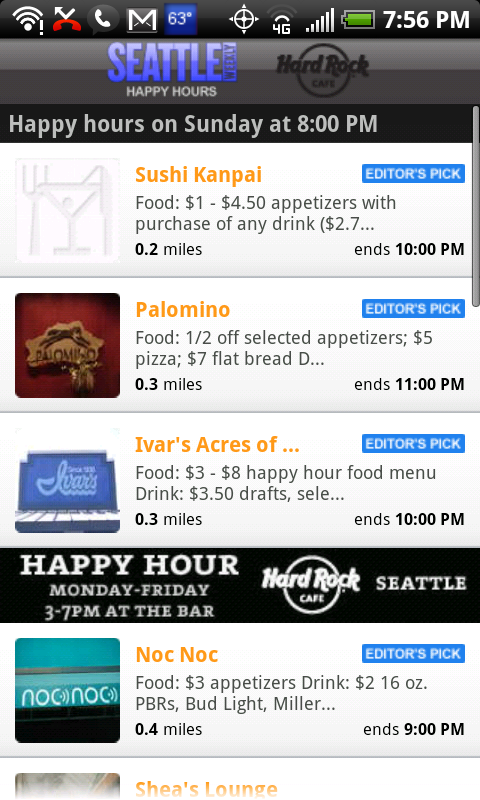 The Happy Hours app on my phone knows where I’m at. On the Web, at best it can guess what city I’m in. Limited screen real estate. People often feel the need to fill whitespace. Nothing else to put there? How about some more remnant ads? With mobile, there is less whitespace to fill. No SEO. The app itself doesn’t have to be filled with links for search engine crawlers. At least half of the GoTime.com home page (the company behind the Happy Hours app) is links for crawlers.